When the Trust was first established, Housing and Jobs were believed to be the route to regenerating North Harris. The results of a community consultation exercise re-inforced this belief. Working in partnership with Mr Ian Scarr-Hall, the community managed to secure the purchase of the North Harris Estate in 2003. GSH, his family business, established itself as one of Harris’ largest employers. Closure of the site was announced in July 2014. 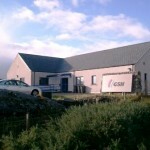 The business centre, on the outskirts of Tarbert that GSH occupied, was built and is owned by Highlands and Islands Enterprise (HIE). In its time, it has been occupied by an aquaculture business, a hardware store as well as GSH, a facilities management company. It is widely held belief, that if the office premises had not been readily available these businesses would not have come. For this reason, we initiated a project to build a number of speculative starter units for small businesses. The aim is to attract new employers and new families to the area. In January 2011, the study into the feasibility of Business Units was delivered. It evaluated three North Harris sites, and gave indicative costs for the development. 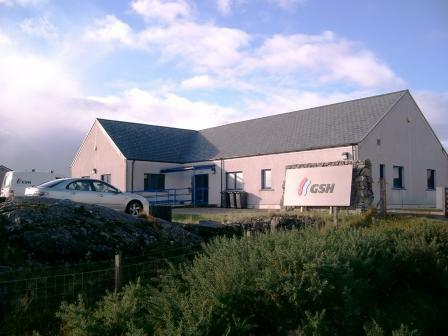 In December, the planning application was submitted for three units on land in East Tarbert. The units have been allocated a use-class of 4. This means that office and light industry will be permitted on the site. Full details of the application can be seen at the council’s online planning portal, using reference 11/00581. At the end of 2013 we had secured funding from the BIG Lottery, HIE and CnES. This, along with our own contribution completed the funding package. Work started on the Iomairt an Obain development site in July 2014 with a February 2015 completion date. Click HERE for more details of Iomairt an Obain. If we can secure new businesses and new families to the area, we will have delivered on two of the Trust’s key objectives in regenerating the North Harris community.